What’s in it for markets? Coming on the heels of unexpectedly strong exports in October, today’s stronger-than-expected industrial production (IP) data for the month isn’t too surprising. The 4.2% year-on-year IP growth was way better than the 3.0% consensus estimate (ING forecast was 3.6%). An acceleration from 2.3% growth in September came from manufacturing and mining output, whereas electricity generation slowed. As with exports, October was the second-best month for IP growth this year. Released earlier this month, the volume of exports surged 14% YoY in October, up from 3.0% growth in September. It wasn't just output either. Overall manufacturing did quite well in October. Manufacturing sales, employment in the sector, as well as salaries and wages, all posted faster growth than September. Strong October activity data suggests that the final quarter of this year is off to a good start. 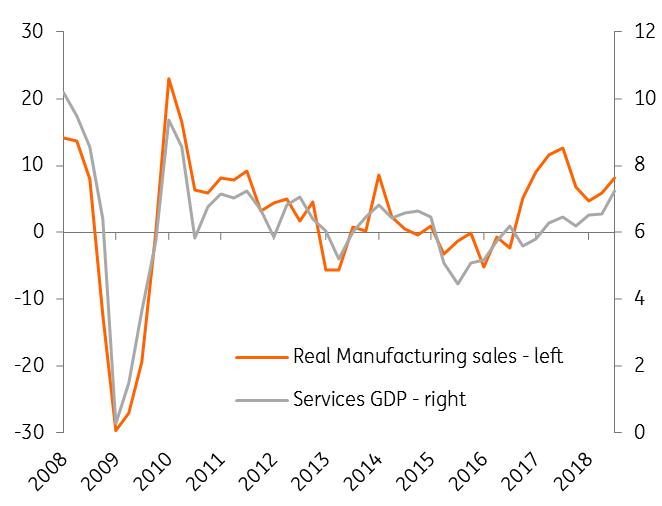 IP growth tracks manufacturing GDP growth, and real manufacturing sales growth (deflated by the consumer price index) tracks services GDP growth (see figures). If growth in both of these indicators in the remaining two months of the year stays in line with the seasonal pattern, we should see a slight uptick in GDP growth in the current quarter. Based on this, our revised estimate puts 4Q18 GDP growth at 4.6%, better than the earlier forecast of 4.1% and up from 4.4% in 3Q18. This also lifts our full-year 2018 growth forecast to 4.7% from 4.6%. A record high trade surplus in October suggests that net trade will contribute positively to GDP growth in the current quarter after detracting from it in the third quarter. 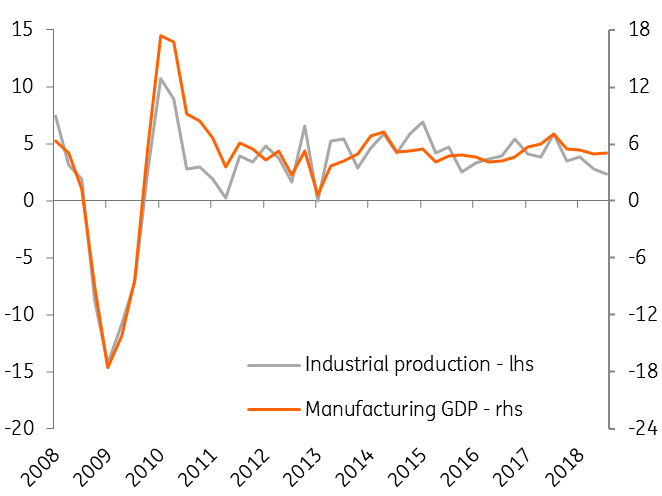 But private consumption will still continue to be the dominant expenditure-side GDP driver as can be inferred from steady manufacturing wages and employment growth of around 10% and 2%, respectively. Unlike recent hawkish policy by some of the Asian central banks – the Bank of Korea's surprise rate hike in late November, and the consensus building for the Bank of Thailand to follow suit at the meeting next week – we do not think the Malaysian economy needs any central bank policy move just yet. Nor do we expect the Bank Negara Malaysia to change policy in 2019. This is positive for the local currency bond market where a supply overhang from a wider fiscal deficit has been a tailwind to higher yields, while equity markets remain hostage to the global sell-off amid a US-China trade dispute and worries of a global growth slowdown. 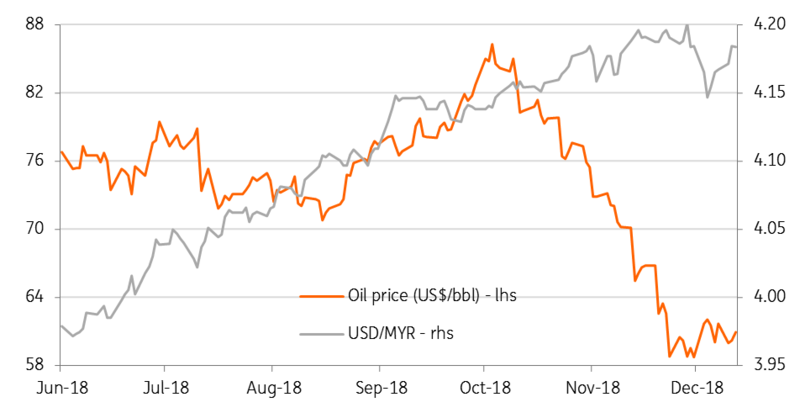 On the positive side though, despite a recent crash in global oil prices, the Malaysian ringgit (MYR) hasn’t been doing so bad. The currency retained its Asian outperformer status in October when the steep fall in oil occurred (see figure) and was in the middle of the Asian currency pack in November. We see the USD/MYR rate remaining below the 4.20, our end-2018 forecast, for the rest of the year.